We went to see The Lords of Altamont last night to film them for Rock n Roll TV and they now officially have Mike Davis as a member of their band. For those of you who don't know... Mike was the bassplayer in MC5!!!!!!!!!!!! Very very cool. And his wife, the beautiful and charismatic Angela... is a knitter! Speaking of which... here is a shot of the baby blanket I knitted up log cabin style. The edges were completed with crochet and it's so cute. The baby is Sophie, the newest addition to our extended family. I had a strange thought today. Along the lines of Buddhist thinking. Imagine if you woke up and you had all the same talents and skills and all the same family and friends but you had no recollection of your past experiences. You would simply get to move forward without any baggage. (good or bad). Because we truly have no past and only have this moment. Yet it's so difficult to grasp that concept. How freeing to lose our egos and expectations and lose those past regrets and .... wow. Alright... it's sunny, I'm hungry and we're meeting some friends later to see Michael Clayton. The picture you are about to see will possibly cause to make cooing sounds such as 'awwww'...'so tiny!'..... 'ohhhh....soooo cute' and that sort of thing. We are not responsible for any reactions you may get while sitting at your computer and making these noises. It is only our duty to share the photograph with you. SUBJECT: stray kitten wandered into our yard 2 days ago and started living under our newly built back deck. We noticed her presence because of a strange mewing sound on Friday afternoon and promptly got her some kitten food which was followed by a run to Petco for better kitten food and flea stuff. On Saturday, we had guests ......one for a classical piano lesson for yours truly and the other guest arriving much later for a songwriting hang. Need I say? All guests were completely entertained with 'kitty'....watching her, trying to get her to come closer, meowing back to her, making toys and throwing string at her to get her to play. It is truly amazing how 5 adults can be transfixed for hours by watching a little kitten. So far, we've coaxed her to hang out ON the deck with us instead of under the deck. She even came and rubbed her head against my toes this morning. So we're making progress in the interaction area. However, I am terribly allergic to cats, so we are trying to see if we can adapt her to being an outdoor cat.....Bam cleaned up a big crate/seat and put a lovely blanket in there...meanwhile, I guess I will dig up that felted cat bed pattern of Wendy's and start knitting. ....Funny, always considered ourselves 'dog people'...I guess the universe had other plans. The fantastic designer has now launched her own line of yarns. If anyone has seen/touched any of them......let me know if they're as wonderful as her designs! Last week, I took a class with Myra Wood on Freeform Knitting. Holy scrumbles batman! This is a whole new level of deconstructed inspiration for me. We learned how to make a scrumble (also known as the act of scrumbling....see, it's both a noun and a verb) and discovered that freeform knitting/crochet really got its start in the 70's from two Brits, Sylvia Kosh and Jim Walters. It is perfect for any of us fiber fiends who like to work without a net....ie....no pattern. And talk about a great way to utilize your stash! Last night we ventured out to Hollywood on a Saturday night for a dose of old fashioned 80's glam rock. Jetboy had reunited and we're really good friends with guitarist, Billy Rowe (who currently has a fantastic punk/rock band, American Heartbreak.) We interviewed Billy and Jetboy singer, Mickey for Rock n Roll TV and at the gig we saw a lot of old friends including Drew the owner of Lip Service along with Scotty (Heat Slick Records) and Jeremy (The Blessings). The Whisky-a-go-go itself ain't what it used to be with rude bouncers moving everyone out of the path every 5 seconds. Your bags are completely searched as you walk in .....to the degree that the bouncer was going to take my RAW FOOD PROTEIN bar from my bag. Yeah, that's a really nasty weapon doncha think? Sooooooooooo rebellious of me! Sigh. It was still an enjoyable evening. Don't get me wrong....before Jetboy played we were highly entertained by The Zeros. But after Jetboy, the typical Sunset Strip-I'm-a-big-angry-white-guy-with-big-trousers-and-a-bald-head-rap-frontguy type band came onstage and any semblance of Hollywood rock n roll that had lived in the club for a few moments was promptly dispersed by angry suburban white kids. On the way to the gig, we had the radio on and caught part of an interview from the New Cars. Todd Rundgren is on frontman duties and you can read about it yourself. Gotta say, the songs we heard sounded really good and like the Cars but still different. Surprising. I've been knitting a lot lately! Whew. It feels gooooooooood! The book is coming along and the skull needles are scheduled to arrive in early February! Woohoo!!!!!!!! But first.......my brand new turquoise velour converse! Debbie Bliss Soho yarn and size 13 needles. It looks really cool on a guy. Is anyone else happy it's November! I love the fact that the weather is cooling (well, actually, it's hot in LA but I know it won't last).........it will be so much easier to knit! Well, the good news is that I'm almost done putting together the various elements of the book. But almost doesn't count does it! The bad news.............the publication date is changed until Spring 2007. Yowsa! That's two more birthdays. That's 2 more year calendars to buy. That's my best friend's newborn baby will be a year and a half old! At first, I admit I was disappointed. But that's because I am used to rock 'n roll where everything goes very fast and fades in and out of oblivion before you can blink. Then I realized that they care about the book and want it to be of the quality that they always deliver. It also means, I can back off trying to be a superwoman and get everything in my life done at once. Dealing with my mom's death has definitely taken a toll on me and now........I feel a sort of relief that the pub date is moved. Bam and I have started talking about making the fourth album. The itchy feeling is back! I think once the book is officially 'turned in' .....we will begin seriously recording the next cd! Hooray! I want these fonts! Don't they rock? Damn! They're so cooooooooooooool. For website design, house fonts are the bomb. We saw New York Doll the day it came out. Arthur Killer Kane. It saddens me to even write about him. Excellent film for one of rock 'n roll's legends who never got the kudos he deserved and the band never received the financial freedom they so rightfully deserved. Great story....from raging alcoholic to mormon...........losing the dream to regaining the dream......all of this which is Kane's life, makes for a great movie. The fact the Dolls were one of my alltime favorite bands EVER.........yeah, that has something to do with it. But a great movie is a great movie and this one is GREAT. Side note on NY Dolls..........in Punk Knits.......there is a long vest modeled by Texas Terri called the NEW YORK DOLLY! Have you ever thought about what type of music yarn would play if it were human? Crystal Palace - Aerosmith.......yep, I've named the whole band. Yankee fun good time rock n roll with some extreme yarns/colors and some stable hits too. Been around a very long time. Lion Brand - Bruce Springsteen - Okay, some of you might get mad at me for that one.......but the Boss is kinda on the stable, solid, no frills, nothin' fancy kinda rock n roll list. Could you have a yarn company that feels more American than Lion Brand? Could you have a rocker that feels more American than Bruce? Alchemy Yarns - Another American for our line-up.......Macy Gray. Alchemy is all about color and intensity...Ms. Gray has that same edginess and wild streak. She just does what she does. And does it so well. Sometimes, .........these are the thoughts that keep me awake at night. Makes no sense I know. And as if my life isn't full of chaos ........we're thinking of leaving LA. I have mixed emotions about it....but......reality is that the housing market here has gotten out of control!!!!!!! Where you may ask are we lookin'? 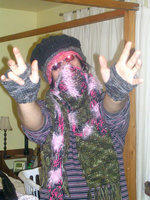 Well...........if there's any of you readers/knitters (my pal Vickie Howell is there!) who live in Austin Texas........we'll be heading out there this year for a 'reconnaissance mission'. Been all over Craigslist checkin' out houses etc etc. Any and all input welcome. It's ALMOST my birthday. Monday, March 21st I will turn.....oh, sorry, got interrupted there! ha! Anyway, I share my bdate with Gary Oldman and Johann Sebastian Bach. I like that company. Bam is planning to take me to dinner on Sunday night cuz my fave restaurant is closed on mondays. On the day itself, we have an interview with a Spanish Magazine, Popular 1 about our trip to Tokyo. After that, I've demanded a movie and lunch. No gifts required. So outside of that............just a film and lunch will do. Birthdays are weird though. I always get depressed around mine. When I was young, I would light up like a sunny day. But now, I find myself reflecting on all the mistakes I've made and time I've wasted. I am determined to look forward this year and not 'GO THERE'! We're playing a gig in Hollywood again.........April 6 at the Cat Club on Sunset. Newly decorated by Monster HOuse (episode airs April 8) on the Discovery Channel. But can I just say........I love this woman's vision! My mom has always been fond of saying I may have a very unstable unpredicatable life but there's never a dull moment. I do love that part and yet... that is probably my complaint at times because, let's face it.......we all like to eat on a regular basis. But yeah, things can change in a whirlwind kinda way. Wow. It's been really weird being back from Japan. The trip was soooooooooo fun and I loved playing on stage every night. Tokyo is like NYC on speed for me. I just get completely energized. We're looking at doing a Japanese-only release of our cd and going back for a looooong tour in October. I hope it happens! In the sense of putting my efforts towards something positive.......I've started to actually learn to speak Japanese! Ha! Just baby steps right now.......but I figure I can listen to the cd's while I'm knitting. I'm all about that multi-tasking way of life. On the opposite end of the spectrum........in Tokyo we were surrounded by good vibes and people who all work together to make it happen. When we came back, there was an outstanding invoice for some digital video work we'd sent to someone's management. (no names here, please) I won't go in to the details.......but the manager called today and after hanging up on Bam.....Bam phoned him back....with such amazement that he thought the phone line had cut out. At which point, the manager hung up on him again. So Bam still thought, hey, the phone is being weird. He called him back again! Then, the manager accused Bam of trying to rip him off and went on and on and escalated to stating he knew where we lived and he was sending bikers 'round to beat us up. WHAT THE F***????????????? This was soooooooooo shocking to both of us.......wow. It's amazing how bizarre folks can act isn't it? That's the weirdest thing that's ever happened to us from trying to collect a payment from someone. Wow. I'm going in to the living room to knit and watch Forrest Gump! Take that you bully you! Okay......I'll probably put these on the Bubble blog too but I'm too knackered to write much.....mega jetlag. I'm learning Japanese to make the next trip even more interesting. At least, a little Japanese! 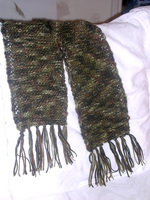 For those of you asking about the Artiste Scarf......I will look up the yarn and try to recall what I did! Hey all! We made it! Whew. Flight was actually awesome. I've put up a photo blog for Bubble over at: http://blog.planetbubble.com But if I have knitting stuff........I'll put it here. he he! How Cheesy Can You Get? Tons of patterns and helpful forum here. This is where I learned the basics! Lots of patterns and terrific articles. The Craftster Forum. Lots of info on here and a great place to ask questions. The title says it all - the place for creative anarchistic punk knitters to hang and brainstorm ideas and challenges! Lots of helpful videos and illustrations on here. Hey you!! Knit for Brains! Fun designs. Good for fast projects that look very hip. If you are one of the 3 people who haven't read this, prepare to dive in and not take a breath until you're done. Unbelievably good fun.